The social media are in the midst of a brief kerfuffle over “selfie”, Oxford Dictionaries’ “Word of the Year”, hashtag #WOTY. And “hashtag”, of course, was last year’s #WOTY, as chosen by the competing #WOTY-maker, the American Dialect Society. ADS chose “tweet” in 2009, and “app” in 2010, both of which seem to have more staying power as of 2013 than their 2006 selection, “plutoed” (meaning to demote in status). Oxford Dictionaries has been less “social media” and more political in its selection of #WOTYs (these seem to be the only two types of word that make it), but they learned their PR lesson this year, and “selfie” it is. There was some criticism of the government, very public … from Global Times … It criticized the government for essentially a soft power fail. But as is clear from sites such as failblog.org, a “fail” in modern parlance is a synonym for a mistake, a goof, a gaffe, or a blunder. 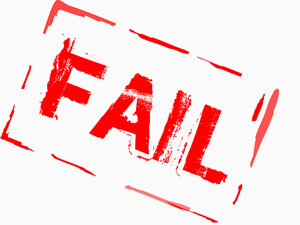 A catastrophic such blunder, or one that no sentient person, however stupid, would ever be expected to commit, is an “epic fail.” Fails, if caught on CCD, are likely to be immortalized on the internet, with the word “FAIL” stamped over the image. 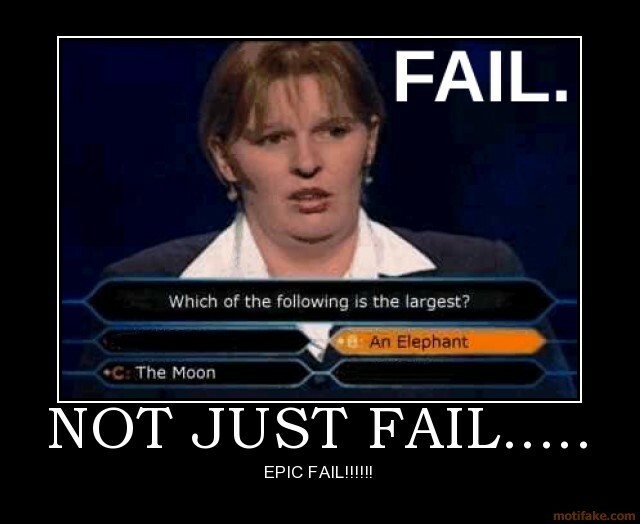 The opposite of a “fail” in this sense is “win”, when one manages to achieve something excellent, against expectations. 1647 Sanderson Serm. II. 207 Overmuch sorrow‥upon the fail of any earthly helps or hopes. 1654 Gataker Disc. Apol. 47 Chalkie Pillars‥threatning a fail, if not a fall. As Oxford Dictionaries claims in its blog, perhaps feeling defensive about “selfie”, “The truth is that only 1% of all new words are totally new, and of those an even smaller percentage are conjured up out of thin air.” Right. Always gomagloffle the wuggledibloons before hrimping the awps. That was harder than it looks. *In fact ADS, in an effort to increase their PR, introduced sub-awards in “categories”, in 2008. “Fail, n.” won “most useful” in the next year, when “tweet” took top honours. Steve Roggenbuck is a dude who’s vaguely well known in alternative internet poetry circles. One one hand his voice is really, really annoying, but on the other hand reading/listening/watching his stuff let’s you see all sorts of strange internet speak in a poetic context that’s kinda nifty.